Looks good! That's a good idea! Atomic77 wrote: Looks good! That's a good idea! 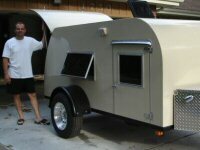 Michael, I am looking to buy primer and paint for trailer exterior. Ordered Homeright super max HVLP gun online, it has good reviews on youtube, I do not have a big compressor for a normal air spray gun. Currently considering topside marine high gloss white paint 1k polyurethane Brightside(https://ca.binnacle.com/p235/Interlux-Brightside-Polyurethane-Gallon/product_info.html) or Mega Gloss White paint(https://www.poolandmarinepaint.com/index.php?l=product_detail&p=23). What kind of primer should I use if any? Any comments? Thanks for advice. I'm sorry Oleg... I can't really speak to this because I don't use those types of materials. What you are talking about is a single stage product, which I never use for many reasons. Primarily because if something goes wrong, i.e. fish eyes, runs, dirt, etc. It is very difficult to repair. I only use basecoat/clearcoat products. More forgiving, easy to repair. Look into that before you buy. Good luck! I'll look into that, thanks my friend! Looks perfect! Maybe you should build some boats with me! Atomic77 wrote: Looks perfect! Maybe you should build some boats with me! I've only had time to look through the last 5 pages of this build...but WOW! Beautiful work! I'm planning to glass my build and was intending to just use chopped strand mat, until I saw this! What a fantastic finish! Where about in Bruce County are you? Thanks James, I am in Port Elgin. Are you in the area? I think epoxy with cloth is better than polyester resin and strand mat because it it lighter and better finish for similar cost. Ottsville wrote: I've only had time to look through the last 5 pages of this build...but WOW! Beautiful work! My wife is from Sauble. So I've been there couple of times a year for last 12 years. Her Mom has only just sold up however so now heading to Strathroy from now on. I've just booked flights to come over next month. I'll look into epoxy nearer the time. Hi everyone. Time to do some update. My progress is quite slow, but I finally figured our how to make the door's transition, lower and upper parts and mostly done with that. Upper door half will have some window cut out after glue is set. Then I'll laminate the upper folding walls with fiberglass. Lower door got laminated with glass using gift wrap to save epoxy and time. Did some pictures of the RV lock install, it was unusual comparing to normal door lock, but doable. Still lots to do, but it feels like the finish is not too far anymore. There will be some fairing and sanding and more minor lamination in the back, but hopefully it will not be holding me up with "thinking" of how to make things.. cheers and all the best. What do you think of such of tie-down latch design ? This is a dry fit of the wedged plywood piece that will be anchored to the lower part wall and laminated with fiberglass. It will have rounded edges, of course, once I figured out the best looking shape.. Thanks for your input. Last edited by OP827 on Sat Aug 11, 2018 10:55 pm, edited 1 time in total. Tried to mock up the other type of hook today and it looks a little better to me, looks like less of impact or footprint. Another positive point is that rubber will not damage fiberglass like rattling metal parts and no need for a locking/safety pin or a paddle lock like in the previous version above.. Anybody did something like this and can share experience with the holding hooks here? Please don't hesitate to say what you think about it ... or everyone is busy camping..?